For my entire 33 years on this planet, I have always been a wear-socks-while-in-the-house guy (my footy pajamaed toddlerdom excepted). Wearing shoes while safe within the confines of my own home has always been an anathema to all that I hold dear (i.e. comfort). I've always seen slippers as shoes' less-durable cousin, so wearing them has never even been a consideration. That is, until I talked to a friend a few weeks ago. Somehow, our conversation steered toward the topic of slippers and he extolled their virtues, namely that they have all the warmth of socks, but they provide more comfort when standing (like when one cooks dinner or does the dishes) than socks. That intrigued me. So, after a period of comparison shopping, this weekend I bought my first pair of slippers (pictured above*) from Target, which, of course, went on sale the day after I bought them. But I've got to say that I'm now a slippers fan. In addition to the whole standing comfortably thing, I also find them to be less confining than socks. The traction that they provide is nice, too. Gone are those unsightly elastic marks around my ankles and shins! While I am not going to be ditching my socks any time soon, consider my comfort paradigm shifted. *For anyone curious as to what my sheets look like, there you go...ladies. 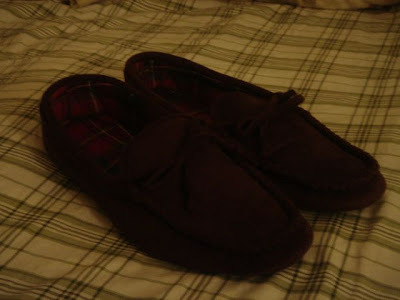 but you who love your pipes so much, i would've figured you to be a slippers/house shoe fanatic as well. shows what i know... ladies. Sure, you'd think so, but I've never been one to sacrifice my personal comfort to maintain an image. That's why I never went Goth, I guess. nine-inch steel stilettos don't fit your comfort quota? Here in the Arctic wastes, I sometimes wear socks AND slippers...or socks and seven-inch Gene Simmons dragon boots. jasdye - No, the stilettos I was cool with. It was all of the buckles, zippers, and long, frilly collars & cuffs that I had a problem with. That and my generally sunny disposition didn't really fit in with their ethos. Dubin - Now I'm wishing that they made Gene Simmons dragon slippers. The way KISS are with merchandising, I'm sure it's only a matter of time. I just did a Google search. We're in luck, but they're kinda pricey. Ha ha! I have a pair of slippers that I am in love with. In. Love. With. I cannot comprehend what my life was like before them. Enjoy! Elaine: "Hey, I've had those since college. They're bunnies." Peggy: "So you... just learned to live with it?" Puddy: "For the most part." Elaine: "OK, we're broken up for the rest of the day." The coolest t-shirt ever? Yes. "The beard stays. You go."